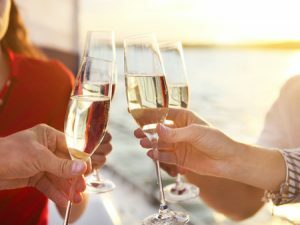 Home » Blog » Private Party Cruise, Private Yacht Charters » Milestone Occasions Deserve Something Extraordinary! Milestone Occasions Deserve Something Extraordinary! Whether you’re planning a grand surprise for a loved one or planning your own bash, Metro Yacht Charters of NY will guide you to the perfect luxurious private yacht! Close your eyes and picture yourself gliding through the glistening waters of NYC on a breath-taking private cruise with your closest family and friends. With the finest selection of private yachts to choose from, let Metro Yacht Charters help you customize every detail: from exceptional service and cuisine, to the perfect entertainment and milestone-relevant theme complete with stunning decorations. If you’re company is planning its 10th Anniversary or its 20th, don’t let this milestone event go by without celebrating in a huge way. Casino themes, cigar rollers, photo booths, calypso steel drums, and live jazz are just a few options that will turn a milestone into an unforgettable celebration! No matter what type of occasion you’re celebrating, commemorating this significant event with Metro Yacht Charters ensures you’ll have a luxurious extravaganza to remember! To Schedule your yacht party today give Metro Yacht Charters of NY a call. Lets get started planning something extraordinary! Take Your Team Building Out to Sea! What keyword did you search?